Not all Homeowner’s policies are the same. Why limit the personal property coverage to named perils only on a traditional HO3? An HO3 is great but an HO5 is even better! 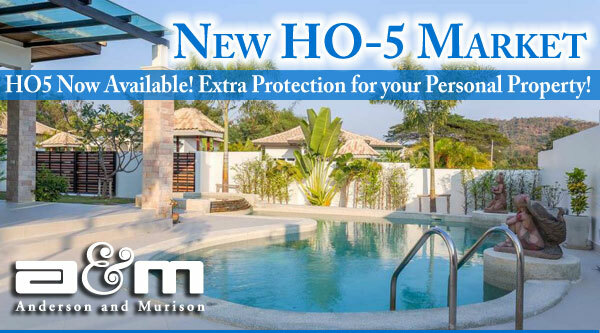 Offer your client coverage for both dwelling and personal property on an open peril basis with an HO5 written through A&M. Visit our website for Personal Lines Information. You get online quoting, binding and policy issuance capabilities with certain markets along with Applications and Forms that might be needed depending on the type of risk (see buttons below). Send us your submissions today! This is a marketing notice only. Nothing contained hereon alters, modifies or changes the actual policy language as may be issued by an insurance carrier.es or changes the actual policy language as may be issued by an insurance carrier. To unsubscribe, please reply and put unsubscribe in the Subject line.